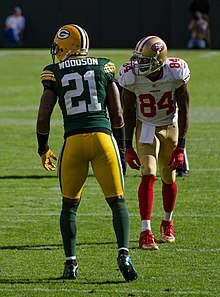 A cornerback (CB), also referred to as a corner or defensive halfback in older parlance, is a member of the defensive backfield or secondary in American and Canadian football. Cornerbacks cover receivers most of the time, to defend against offensive plays, i.e. create turnovers in best case or (more common) deflect a forward pass or rather make a tackle. Other members of the defensive backfield include the safeties and occasionally linebackers. The cornerback position requires speed, agility, and strength. A cornerback's skillset typically requires proficiency in anticipating the quarterback, backpedaling, executing single and zone coverage, disrupting pass routes, block shedding, and tackling. Cornerbacks are among the fastest players on the field. The chief responsibility of the cornerback is to defend against the offense's pass. The rules of American professional football and American college football do not mandate starting position, movement, or coverage zones for any member of the defense. There are no "illegal defense" formations. Cornerbacks can be anywhere on the defensive side of the line of scrimmage at the start of play, although their proximity, formations, and strategies are outlined by the coaching staff or captain. When a team is using zone coverage, some areas of the field require special attention when defending against specific pass plays. They include the flats (to defend the screen pass and hitch routes), mid range zones including the void (to defend the "stop n go", quick post, fade, hook, curl, and "sideline" or "out" routes), and finally the deep zones (to defend the post/deep post, chair, streak, "fly", "go", bomb, or Hail Mary routes). These are basic terms (perhaps the most generic) for the basic zones and routes which vary system to system, league to league, and team to team. Advanced forms of coverage may involve "quarterback spies" and "containment" coverages, as well as various "on field adjustments" that require shifts and rotations; the latter usually initiated by the captain of the secondary (typically the free safety) during the quarterback's cadence. At this time the captain attempts to "read" the alignment (pro set, split set, trips, etc.) of the offensive "skill players" (backs and receivers) in order to best predict and counter the play the offense will run. He will base his decision on past experience, game preparation, and a sound comprehension of his teammates strengths, abilities, and tendencies. These adjustments may change on a play by play basis, due to substitutions or even evolving weather or field conditions. For example, defensive coordinators may favor a tendency to play a less aggressive containment style zone coverage during wet or slippery field conditions to avoid problems associated with over-pursuit (when a defender takes a poor angle on a ball carrier and cannot redirect in time due to poor footing). If the jam fails, the cornerback is usually flat footed and not in a suitable position to defend the mid to long-range passes. When this occurs, the safeties and linebackers usually cannot return to their zone obligations in time, especially if they were anticipating a run as the play began. In essence, the defense is unnecessarily "stretched" to its breaking point. Receivers who can effectively avoid the jam and stretch defenses are far more likely to create big play opportunities for the offense. Therefore, it is vital that a cornerback execute a proper funnel or jam to allow safeties and linebackers enough time to return to their zone responsibilities in the event of an unforeseen pass play. By working together and familiarizing where one's help may come from, a higher degree of confidence is established among the defensive secondary as a unit, with the end result translating into a much more formidable defense against both the run and pass. Single coverage in the "red zone" – the area between the twenty-yard line and the goal line – is usually designed to prevent receivers from slanting towards the middle of the field. These types of routes are difficult to stop in the red zone because this area is usually congested with bodies colliding, crossing, and weaving in different directions. Although illegal, defenders are easily picked or screened by opposing receivers and sometimes by their own teammates; this is illegal yet difficult to enforce in short field, congested situations. To avoid this, it is often favorable for cornerbacks to either: "switch" assignments, where he will agree beforehand to trade assignments with one of his fellow defenders in the event that the receivers criss-cross as the play begins, or alternatively, a corner may instead line up very close to the receiver at the line of scrimmage to force or "jam" him toward the sideline (outside) without violating the 5-yard no-touch rule. Corners often refer to this second style of coverage as the "man under" technique. ^ A Brief History of the Game. ^ "NFL Rules Digest: Position of Players at Snap". Retrieved January 7, 2010.